Over the years I have had many friends ask me how long can I keep a bottle of wine once it has been opened? Before answering, I generally ask them how long they keep theirs. I have been told people re-cork the bottle and typically save it for days and I’ve even had a few say they’ve kept it for weeks! I will suggest that without the proper methods of preserving your wine, it will turn to vinegar within days. Did you ever wonder why wine turns to vinegar? There are a few natural organisms in wine; Lactic Acid bacteria, Acetic Acid bacteria, and Brettanomyces (Bretts), which is a wild yeast. Lactic Acid bacteria are very important. Without Lactic Acid, what we eat would be much more boring. Bretts is a naturally occurring yeast in wine and if not controlled properly, this yeast will cause horsey and sweaty smells. Some parts of the world’s winemakers take advantage of the wild yeast. One region would be Burgundy (Pinot Noir). Active Acetic acid bacteria are always a negative in wine and is sometimes called vinegar bacteria. Once the wine is exposed to air, over time, the Acetic acid starts to become active. 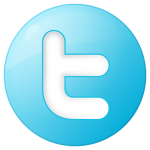 The combination of alcohol and the active Acetic acid creates Ethyl acetate. The active Acetic acid smells like vinegar and the formed Ethyl acetate smells like nail polish remover. Obviously, neither one is desired in your wine. If you have a bit of wine left in your bottle, I encourage you to leave it open for a period of time and smell it. Now that we are done with the chemistry lesson, how do you preserve your wine once it is open? There are two low-cost solutions. Both can be purchased at your local liquor or home goods type store and they do not cost very much. Wine Preserve is a gas. 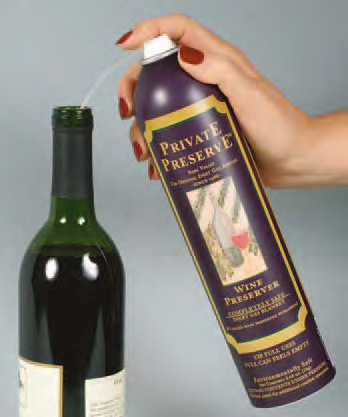 It seals opened wine to preserve flavor. Safe nitrogen, carbon dioxide, and argon blanket the wine. Capacity: up to 120 bottles. Just insert the provided straw into the bottle and give it a few short bursts. The harmless gas rests on top of the wine. Once you add the wine preserve you should re-cork the bottle. Keep the bottle upright and do not shake it. It should keep for quite some time. Many days, weeks maybe if kept cold and out of sunlight. I have to use the wine preserve gas for my white wine making and it does a great job saving the wine. My other suggestion to save wine is one that I actually use frequently. 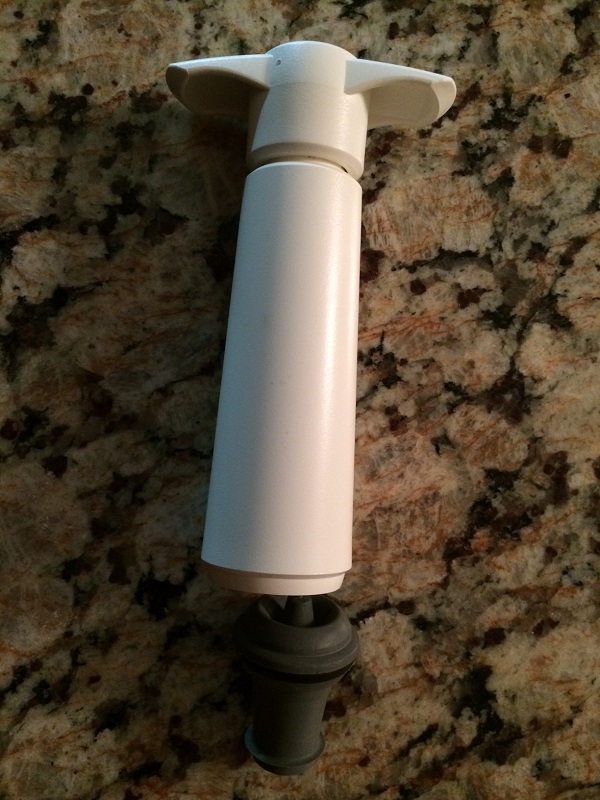 I use a wine saver from Vacu Vin, which is a is a low-cost solution less than $15 or so and includes two stoppers. It comes in a few color options and using the Vacu Vin is simple. 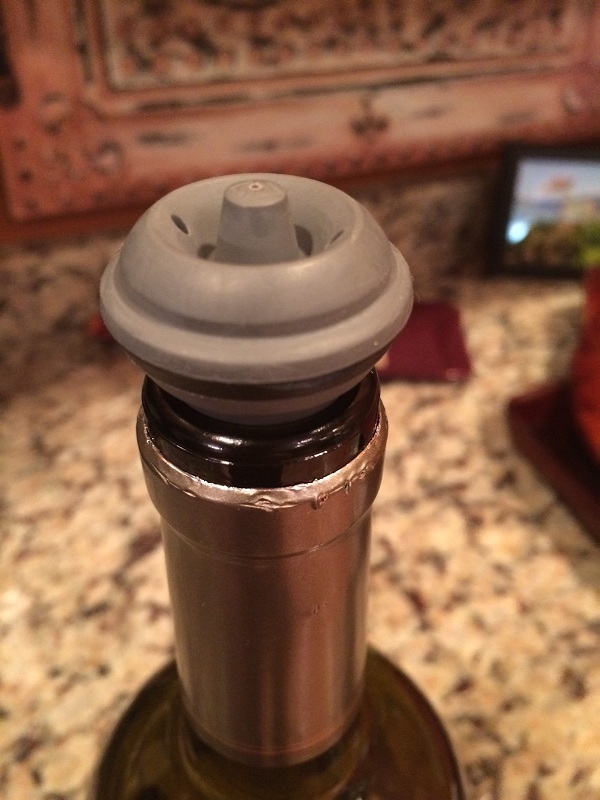 Once you have had enough wine from a bottle and would like to save the rest of the wine, you simply insert the stopper into the bottle. Insert the Vacu Vin in the stopper and then pump out the oxygen. I generally pump around 15 times. You will feel the pressure increase as you pump the air out. The Vacu Vin Wine Saver also takes all the guess-work out of wine sealing with its unique vacuum indicator feature, which emits a “click” sound when you’ve reached the optimal vacuum level. The stopper inserted into the open bottle. I decided to give the Vacu Win the “test”. We had a glass of wine before going on a business trip to Florida on a Wednesday. 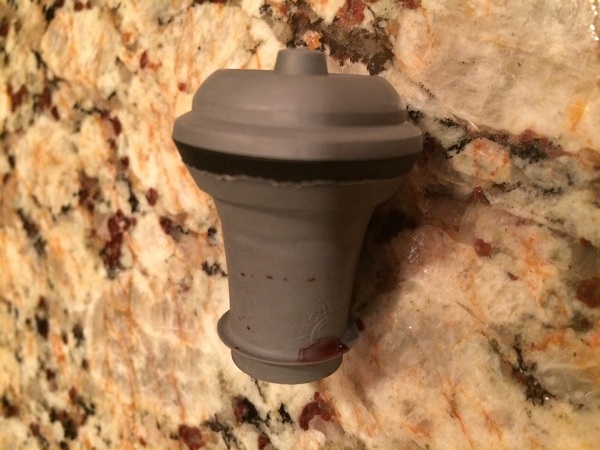 After our glass of wine, I inserted the plunger and removed the oxygen. I labeled the bottle and put it in my pantry where it is cool and dark. Five days later it was time to test the wine. 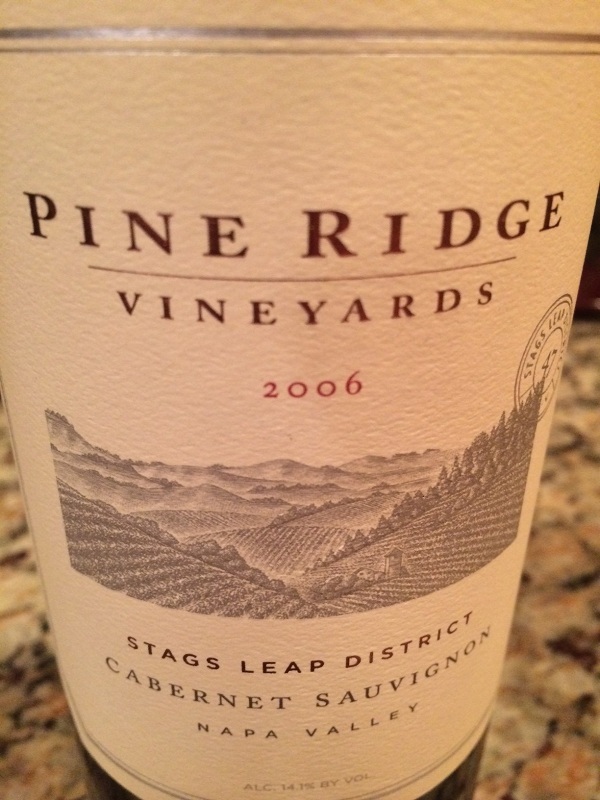 I was actually not surprised that the 2006 Pine Ridge Cabernet Sauvignon smelled and taste just like the day I opened it. I was tempted to retry the test for ten days and see if the wine holds up, but decided that I should try it with a lesser valued wine just to be safe. 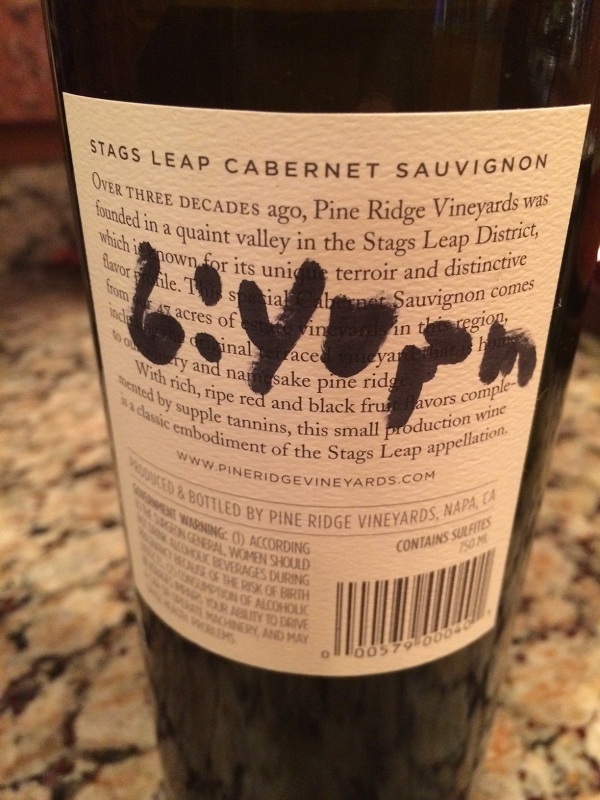 I rated the Wine Preserve Gas and Vacu Vin five glasses.